Also see the "Early History of Marquette County" transcription of a paper written by Laura Bertha Tagatz in 1920. It's clear Laura's paper relied heavily on the history written in the 1878 atlas, but she includes additional details. Laura was the daughter of Fred Tagatz. The following transcription was taken verbatim from the above-referenced 1878 atlas (from page 223). I have broken the lengthy paragraphs into shorter paragraphs to make it easier to read, but otherwise have tried to be true to the spelling, text and punctuation of the original document. Although I've done my best to be accurate, there may be transcription errors that I failed to catch. This county was formed from Brown by an act of the territorial legislature, of Wisconsin, approved December 7, 1836. It embraced twenty-one townships, including a portion of the present limits of the county. The county seat was established at the village of Marquette, and the county was attached to Brown for judicial purposes. 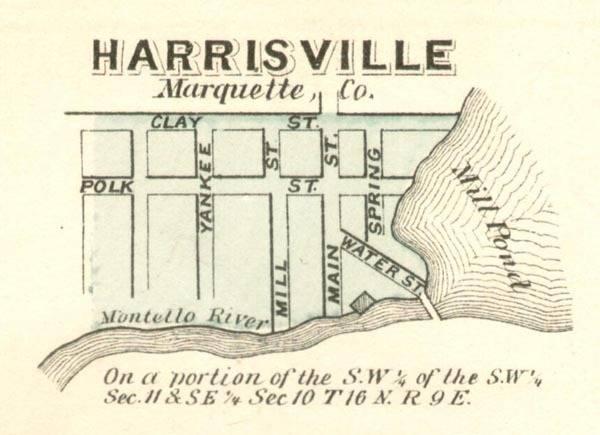 By an act, approved January 22, 1844, to take effect the first of March, the county of Marquette was organized for county purposes and an election ordered to be held at the house of S. W. Beall, on the first Tuesday of April following, the returns to be made to the town clerk of the town of Marquette. By one of the provisions of an act, approved February 22, 1845, the county officers were authorized to keep their offices where best suited their convenience. It was organized for judicial purposes in 1848, and made part of the third district. The first county officers under the state under the state constitution were: John S. Horner, county judge; D. R. Shailer, clerk of board; F. B. Hawes, clerk of court; Thomas Williams, county treasurer; C. Meade, district attorney; Paul D. Heyward, register of deeds; J. Luce, sheriff; C.H. Larrabee, circuit judge. 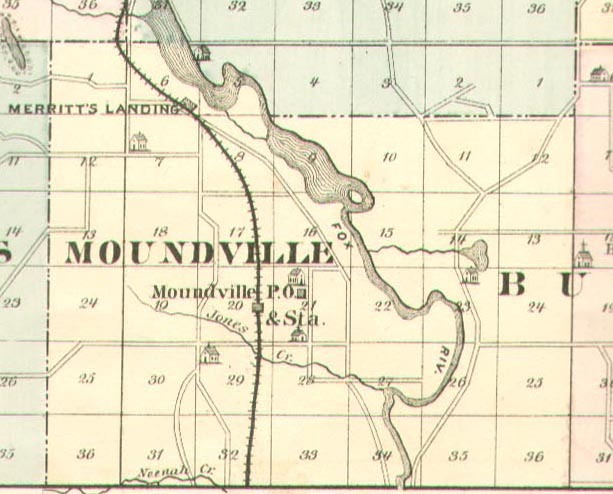 The boundaries of the county were enlarged in 1849 by the addition of thirty-five townships, including most of the present Marquette and Waushara, with a small part of Green Lake county. 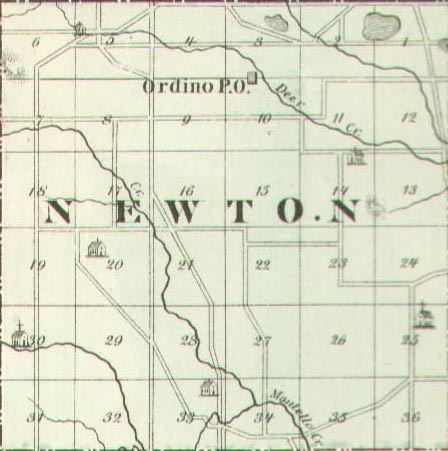 As at present constituted this county contains twelve full and two fractional townships, embracing 266,442 acres, and has a population of about nine thousand. It is bounded north by Waushara, east by Green Lake, south by Columbia, and west by Adams. The name of the county commemorates the Jesuit, Father Marquette. 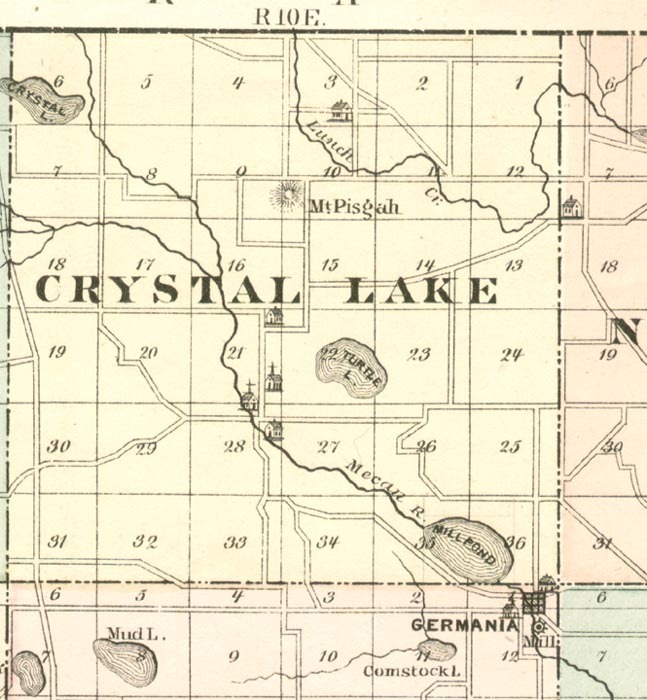 The last division of this county was in 1858, whereby Green Lake county was detached. During their brief history, the people of Marquette county have been called upon to vote seven times of the question of changing the county seat. The coveted prize was hotly contested, and for years it was the main issue in local elections. The ill passions engendered have given place to an era of good feeling, and the county seat rests at Montello. The court-house is a plain, substantial building, erected in 1864, of stone and brick. The present county officers are: H. S. Thomas, county judge; M. G. Ellison, county clerk; C. F. Roskie, county treasurer; John Barry, circuit clerk; C.H. Pierce, register of deeds; S. W. Stimson, sheriff; G. H. Peters, district attorney; M. Finnegan, county surveyor; H. M. Older, county superintendent of schools; S. R. Rood, chairman board of supervisors. 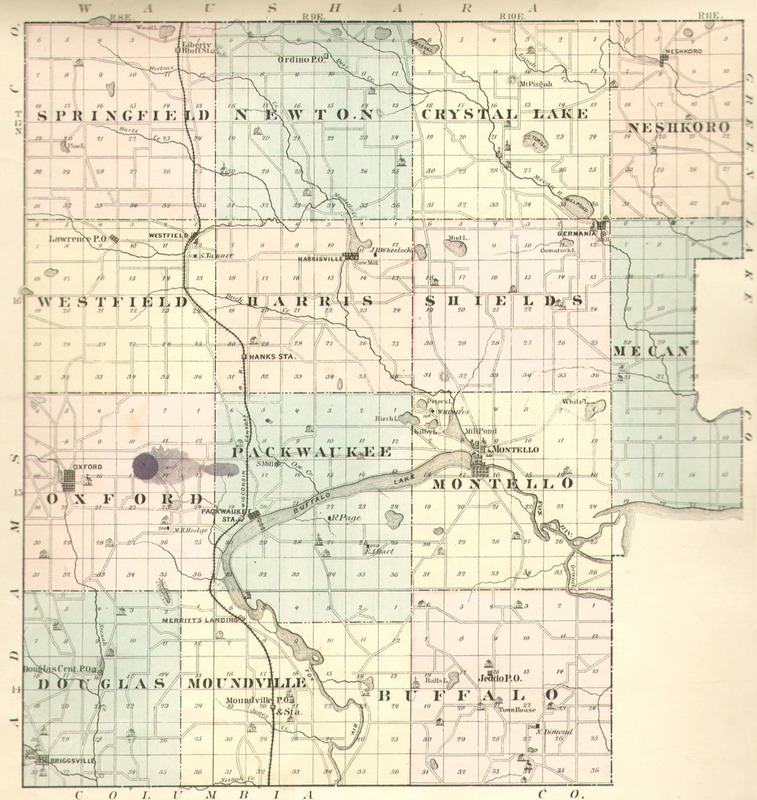 This place, sometimes called Hill River, the county seat, is a prosperous village of seven hundred inhabitants, located on the Fox, at the mouth of the Montello river, and the outlet of Buffalo lake. It has the substantial elements of growth -- intelligent, public-spirited citizens -- surrounded by a large and wealthy community of farmers, and possessed of a water-power surpassed by few in the state; in fact, it has two water-powers, one at foot of Buffalo Lake, and the other on the Montello, the former with a present fall of three feet, the latter, of fourteen, the supply in both uniform and inexhaustible. It is estimated that the equivalent of one thousand horse power remains now unutilized, and this power at small expense can be nearly doubled. A moiety of the power is employed by the "Montello Flouring Mills,"with four run of stone, and by the "Montello Woolen Factory," with capacity for annual consumption of seventy-five thousand pounds of wool. Excellent brick is manufactured in the village. A fair quality of sandstone is abundant. The stores seem adequate for the demands of a much larger city, yet they are well supported. There is one large, finely located school building, two hotels, the American and the Fountain, two new and elegant church edifices, the Methodist and the Catholic. There are four lumber yards, and all the shops, agents, professional men and furnishings of a live western town. A newspaper was started in 1855 by F. A. Hoffman, called the Marquette Young American, but suspended in 1862. 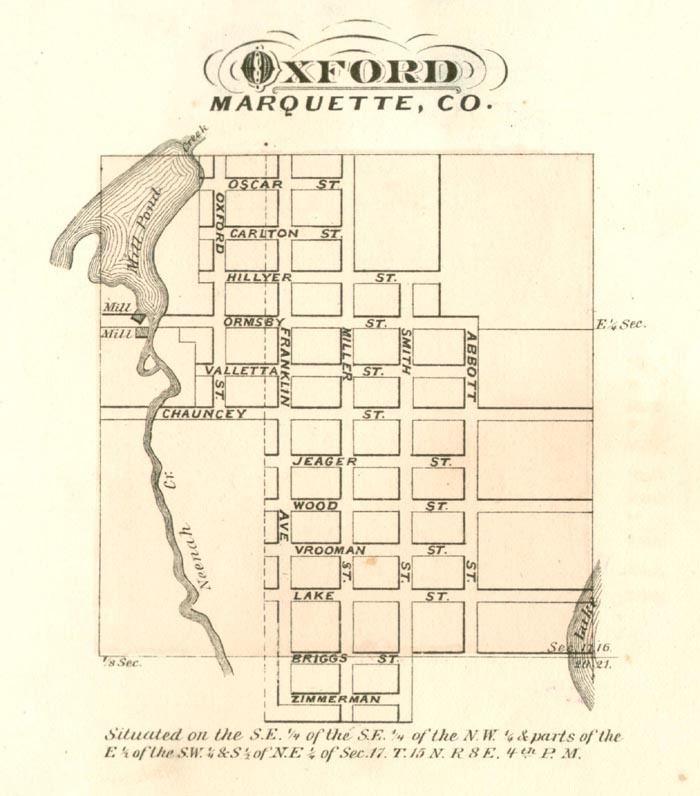 The Marquette Express, now the Montello Express, was founded in 1859, at Oxford, as an independent journal. After removal to Montello it was conducted by S. A. Pease, as a democratic organ until 1862, when Messrs. Goodel & Cogan became proprietors and editors, under whose management is still remains. It is the only paper in the county, and is ably conducted and well sustained. The village has a charming location upon the shore of the placid Buffalo lake, with towering bluffs and encircling rivers. A marked geologic feature is the huge outcrop of granitic rock, projecting boldly upon the side of one of the main business streets. Some of the surrounding lands are sandy. Most are oak openings, while, perhaps, one fourth of the county is marsh or rich alluvium. Good farming lands can be bought for ten dollars per acre not far from either of the nine villages in this county. 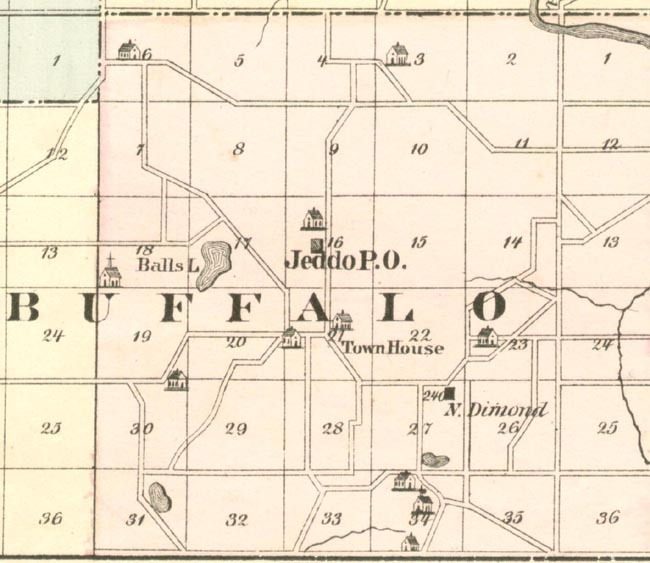 The first settlement within the limits of the present county was in the town of Buffalo, by H. F. Owen and J. I. O'Blanis, in the spring of 1848. The first school-house in the county was built soon afterward. The first teacher was named Birdsall. 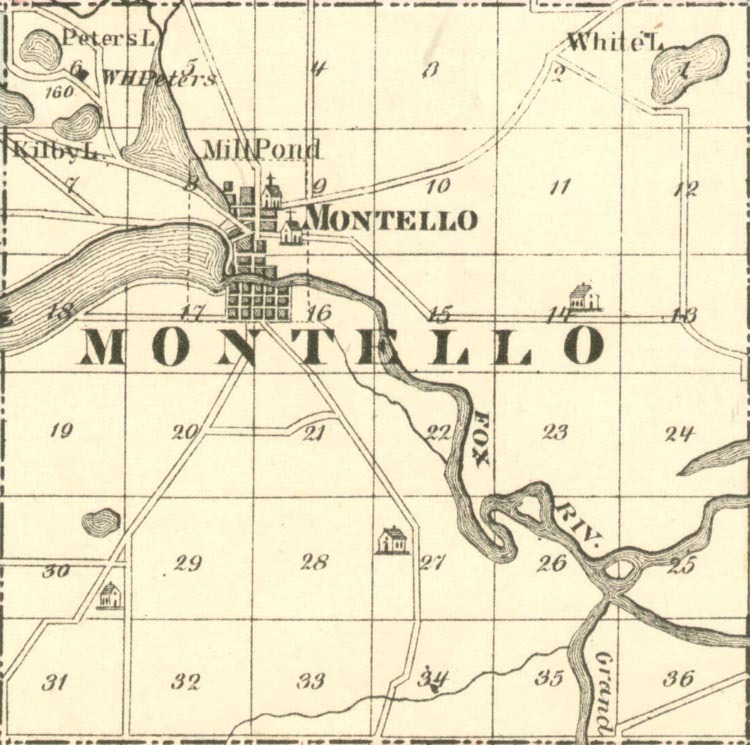 The lands upon south side of lake were in market several years earlier than on the north, yet Jason Daniels and "Uncle" Jesse Dart settled in Montello in 1849, upon what was known as the "Indian lands." They still live, and show but few effects of pioneer hardships. 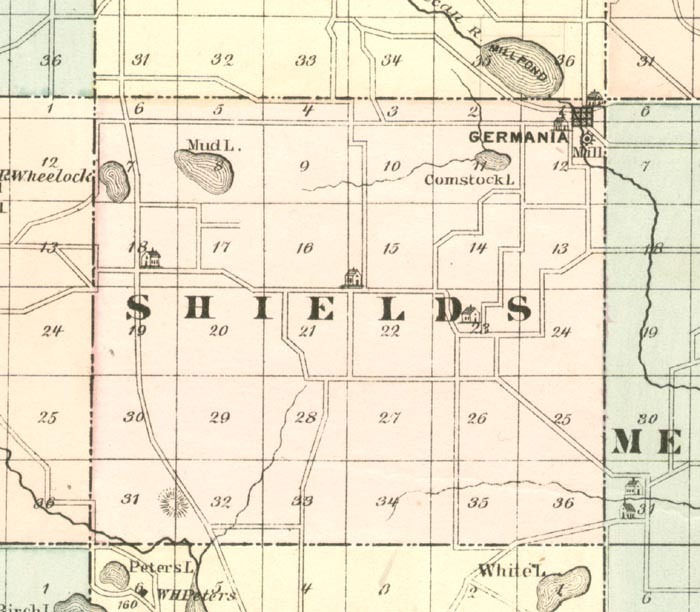 In 1849 a Catholic society was existing on an island in Spring lake in the town of Shields. The first Protestant clergyman was Isaac Smith, a primitive Methodist, who held meetings in the different settlements in the autumn of 1848. 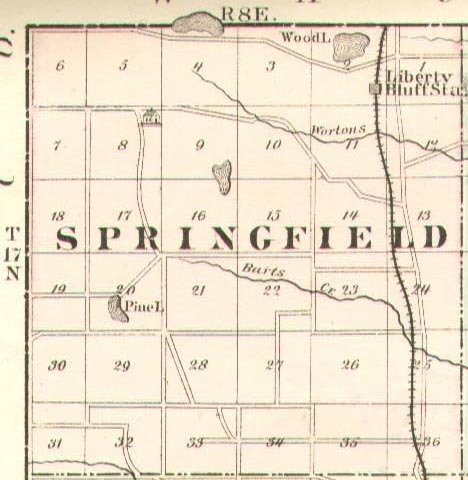 S. A. Pease came to this county in 1850, and was its first practicing physician. 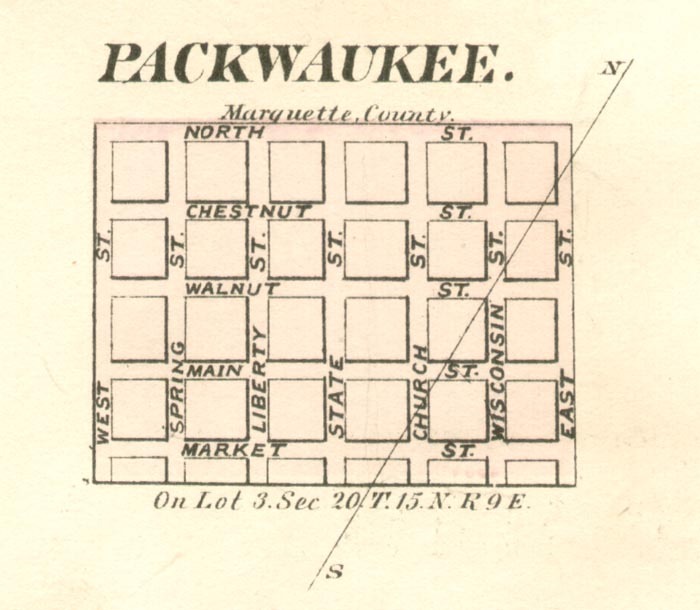 The first entry of government land was May 11, 1836, by John Noyes, in the present town of Packwaukee. 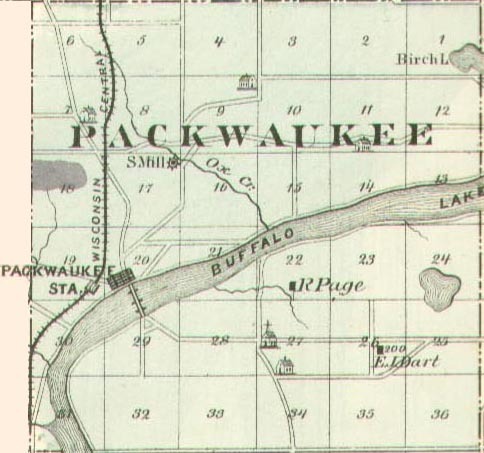 The tide of immigration of 1850 flowed mainly to Packwaukee, which was named after a friendly chief of the Winnebagoes, and for several years it was the leading business center of the county. Our nation's birthday was appropriately celebrated here upon the shore of Buffalo lake, in 1850. James Cook, the first lawyer in the county, delivered the oration. The blessing of the God of nations was invoked upon the unfurled flag, by Rev. Jonathan Post, a resident of the county, who, with his wife, was afterward murdered and shockingly mutilated by an insane son. 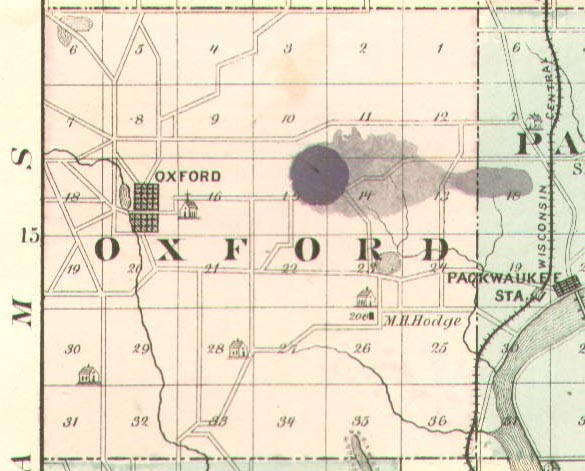 This town is the only one in the county having both river and railroad communications; its situation upon the navigable Fox river, and also upon the Wisconsin Central railway, gives it rare advantages as a center for shipping and exchange. The first act of the circuit court, organized September 4, 1848, was the issue of a document to Thomas Allen, wherein he declared his "intention" of becoming an American citizen. 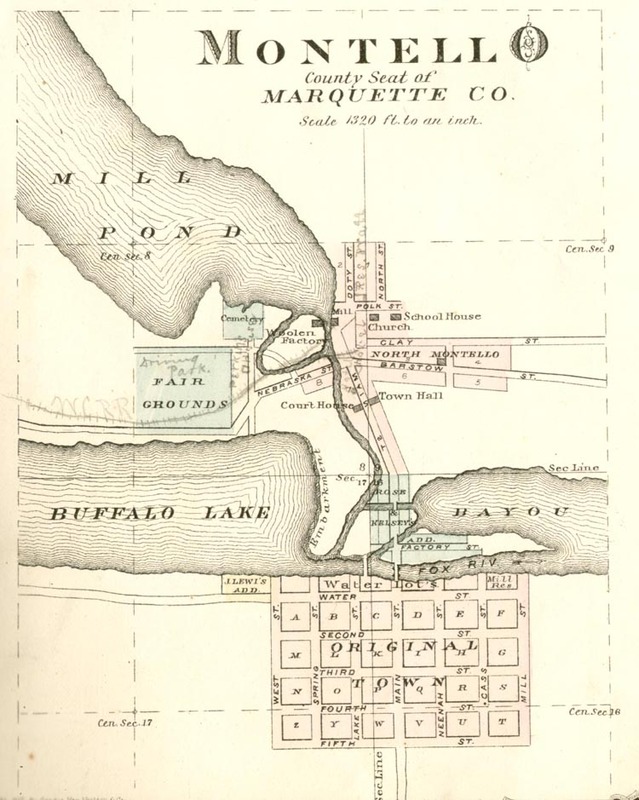 The first deed of land in Marquette county (then in Brown county) was dated August 22, 1836. The coming of the first steamboat up Fox river, in 1851, was hailed with enthusiasm as the pioneer of progress and civilization. This section of country has been greatly benefitted by the improvement of navigation upon that stream. 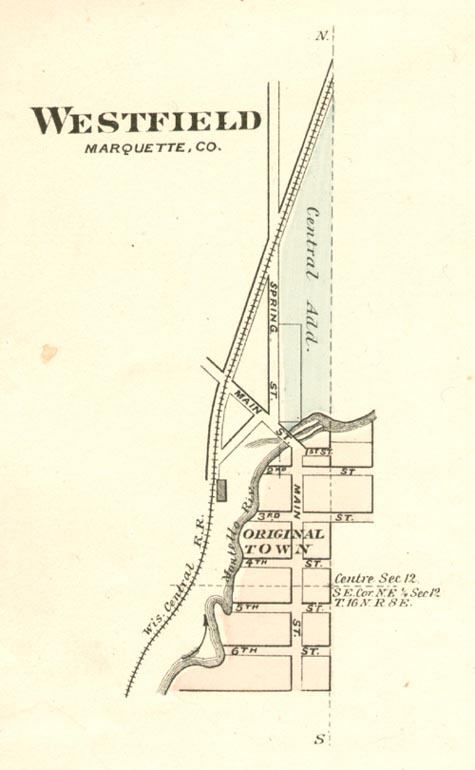 Neenah creek runs through Oxford, Douglas Center and Briggsville, with improved mill privileges in each town. The Montello furnishes power for mills and factors at Lawrence, Westfield, Harrisville and Montello. 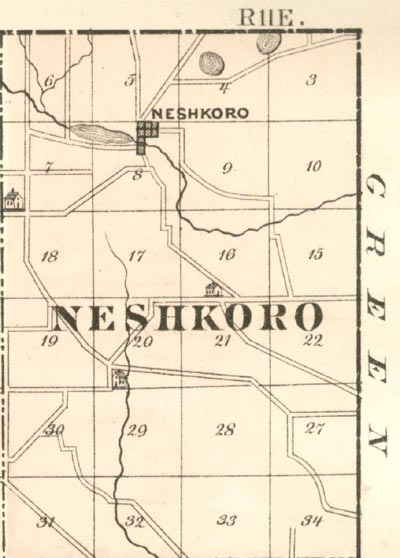 The Mecan drives one mill at Germania, and White creek supplies a mill and foundry at Neshkoro. 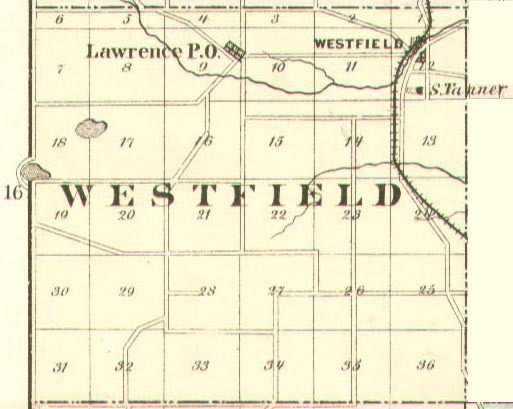 The western townships are peopled mainly by Americans, while in the eastern and northern portions of the country, the foreign element is well presented, there being about equal numbers of Germans, Irish and Americans; yet, by the census of 1875, fully half of the inhabitants were born in the county. 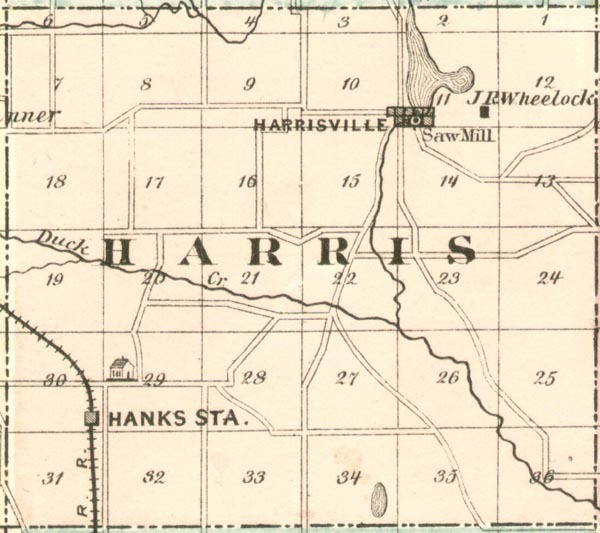 John Barry, present circuit clerk, has resided in the county from early boyhood, and H. S. Thomas, now county judge, still retains the land he entered in 1849. The chief exports of the county are wheat, corn, rye, pork, butter and cranberries, together with the products of the various factories. A large amount of fish, pickerel and bass, are annually caught in the rivers and lakes within the county limits. Firewood can be hand for the cost of cutting and marketing. A county agricultural fair is annually held at Montello upon the well-fitted ground of the "Horse Trotting Association." It has the usual effect of increasing the interest in all the products of the farm. The society seek to promote the general interests of the farmer, and the "trotting element" is not offensively prominent. Buffalo lake, fourteen miles in length, was the favorite resort of the Indian on account of its fish, wild rice and ducks. It is not a quarter of a century since savages by hundreds camped upon its shores, particularly in Packwaukee, and fared sumptously on the abundant fish and game. The nearly decayed palings of Indian graves are still visible. Edward McCaffrey, an honored pioneer of Packwaukee, describes a large camp of Winnebago and Menomonee Indians on the north bank of Buffalo lake, as late as 1855. Their burial scenes and dance orgies are well remembered by many old settlers now living. But in pre-historic times, or prior, at least, to traditions of the Indian race, there lived here the mound builders. Hundreds, perhaps thousands of their earth monuments stand in this county not far from the river or lake, and continue to puzzle the beholder who would know their purpose and also the character of the builders. These mounds are of various forms, most are conical or oblong; some are cruciform, while others clearly resemble animals. On the summit of some stand full grown trees, perhaps a decaying oak exceeding two feet in diameter. They are always composed of surface soil, yet the surrounding alluvium is of average depth. When, and how, and why were they built? Exceptional ones on the bluffs at bends in the river, or on the promontory on the lake, were, perhaps, for defense, some possibly for tombs, as bones exhumed would indicate. Excavation usually yields little results, though sometimes are found pieces of coarse pottery, and rude implements. Moundville, as its name indicates, abounds with these antiquarian puzzles. 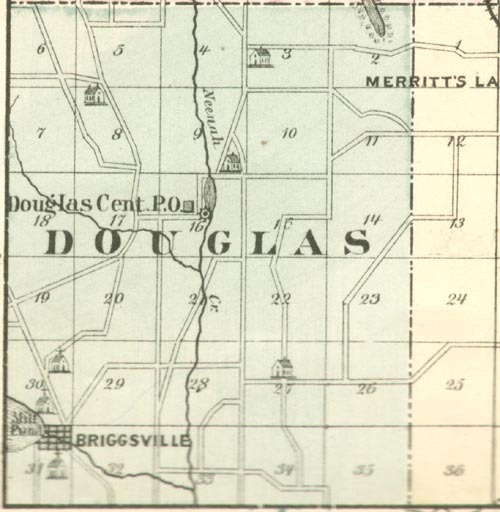 The southern division of the Wisconsin Central railroad, which extends from Stevens Point to Portgage City, passes through the western townships of this county. It was completed in 1876, and the revived industries and quickened activity of the county attest its beneficial influence. The surface is undulating, the prevailing soil is sandy loam -- in places very sandy. Near the streams are abundant hay marshes; others can easily be adapted to the raising of cranberries; as a whole, it is a county of oak openings. Much of this timber has been removed and the land cultivated while considerable areas, especially those owned by non-residences, has been suffered to grow up again in brush and timber. The only elevation is in the northwest corner of the county, called Liberty bluff. It is several acres in area and rises on three sides abruptly, fifty to eighty feet, with a ragged wall of sadstone [as written -- I assume they meant sandstone]. Norway pines grow upon its summit, and are not found elsewhere in the county. There are but two saw-mills and one foundry within the county limits. The four woolen factories and ten flouring mills are centers of industry and exchange. With the proper use of the water-power in this county, many of its villages would soon become thriving cities. There are seventy public schools, well sustained, yet none of them graded. Most of the settlers came with meagre [as spelled] capital, but are now blessed with competency. Very few farms or homes are mortgaged. Lawyers are the least prosperous class in the communities. More than the usual percentage of the farmers have remained permanently upon their original settlements. The people are hospitable and moral.